Human sleep cycles through initial stages of falling asleep, into slow-wave (non-REM) stages, down into REM (active dreaming) stage, then back up through these stages. That cycle repeats several times through the night. Usually the period of the first cycle is the longest. 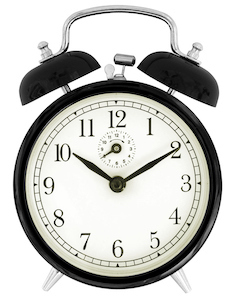 Later cycles take shorter periods of time, and may cycle all the way back to waking up before falling back asleep. The patterns of those cycles change as we grow from babies to children to adults. Generally, healthy adults get 7-9 hours of sleep - fewer than 5 hours a night, or more than 9, is not recommended. Timing for those hours may shift in older adults, though. It's not unusual for seniors to fall asleep earlier (and wake up earlier). Our sleep cycles are linked to other body processes, including building memory and strengthening cognition, releasing hormones that support the immune and endocrine systems. Studies of people who have gone without sleep (from jet lag, working swing shifts, etc.) found that lack of sleep often leads to poor coordination, inattention, making incorrect decisions, irritability, and much higher risk of accidents. Newer research is finding links between sleep disorders and our mental states, our physical coordination, our emotions and our metabolism (even appetite and weight gain). All good reasons to maximize our chances of getting a good night's sleep regularly. Insomnia - difficulty falling asleep, difficulty staying asleep, or both - is not unusual. It's estimated at least half of seniors experience this at least sometime). Sometimes it is a direct reaction to a crisis or to a difficult situation. But if insomnia doesn't resolve, either by practicing healthy sleep habits or as the difficult situation improves, then it would be wise to talk with the health care team to see if this is a symptom of a larger problem. Consult your health care team if experience insomnia several days a week, lasting for months. Insomnia is also a known side effect of many medications. If your sleep is troubled, ask your health care team to do a review of all the medications you are taking (not just prescriptions, but also over-the-counter medications too). It is also possible that worrying over insomnia makes it even harder to sleep, as explained in this video. Meditation or mindfulness practices can help, or psychotherapy to cope with anxiety. If a sleep disorder is suspected, the health care team may ask you to do a sleep study. Sleep apnea is one of the most common sleep disorders (estimates range from 10% to nearly one-third of all older adults). While it can have serious effects if untreated, the good news is that it is very treatable. If the diagnosis is sleep apnea, the team might prescribe using a CPAP (Continuous Positive Airway Pressure) machine while sleeping.